Bluegrass, New Grass, Old Time, Mountain Blues, Folk, Roots, String, and all groovy things music in between! INSIDE THIS ISSUE: Little Fest Rocks Small Town Tunes Reveberb Nation Nu-Blu ... and more! See Our Ad on the back page for great prices! listening to some great bluegrass courtasy of Joe Mullins and the Radio Ramblers, and the Staunton, VA Parks And Rec. Dept. What a great way to spend an evening - hard to believe it’s August, and we were chilly. Fall is creeping in, and that means even more wonderfully cool evenings filled with live music! I can’t wait. Check our pages well becasue in this issue we have loads of cool festivals for you to attend and several artists who what to make you aware of their latest CD project. A big Americana Rhythm welcome goes out to our new readers at the Americana Music Association conference, Bristol Rhythm & Roots, and the IBMA, World Wide Bluegrass gathering. Thanks for picking us up, and we hope you’ll join our great big Americana family. And congratulations to all the IBMA and AMA nominees this year - what an amazing bunch of talent! of oak trees there sets an enchanted place that each summer gets filled with enchanting happenings. Yes, it is an outdoor playhouse and what a wonderful place to play it is. Of course, if you live in the Augusta County part of the Shenandoah Valley, you’ve already guessed the name of this enchanted place and yes, it is the Oak Grove Theatre. Each summer this playhouse hosts an outstanding set of five plays put on by a very talented community theater group. Patrons of this fine venue often come in the late afternoon and tailgate before enjoying the play under the Shenandoah Valley canopy of stars. Should you think plays are the only art form presented at Oak Grove, you would be overlooking a very special music festival that occurs there each summer. The Oak Grove Folk Music Festival is an annual event now in its 34th year of production. This festival is three days of traditional and not-so-traditional folk music variety that mixes national acts, and regional touring artists with the best of the local folk music scene. The Oak Grove Folk Music Festival is produced by Theater Wagon of VA productions with the help of a ton of dedicated volunteers. Recently, the folks here at AR met Ms. Rosalin Collins who is the visible face of this wonderful little music festival. We asked her if she would give us an insider‘s view of the Oak Grove experience and what follows is her story. where the theater is now located). Mr. and Mrs. Collins eventually determined that farming was not going to support their family of five, so Mr. Collins (Fletch) went to work for many years to teach theater at Mary Baldwin College. (It is important to note that the theater at MBC is now named after him). Eventually, the Collins decided to build a theater in their backyard, or as Rosalin puts it, “in the oak grove”. The theater was to be a place that the students would have to do plays in the summer. Ms. Margaret Collins then began writing plays for the students to perform. Rosalin tied her connection to this history with this statement, “It was there that my mother, one of Fletch’s MBC students met my father who is Margaret and Fletch’s oldest son. So, you can see that my ties to the theater, the production group, and the music festival are so deep—they are genetic!” Presently, the theater is owned by a dedicated non-profit Oak Grove Theater group. They also own Pennyroyal Farm and quite a bit of land around the theater. The long-range plan is to purchase more surrounding land so that the parking area and the entire theater will be protected from development. The theater produces five plays each summer and has been doing so since 1954. Robin and Linda Williams; one of this year’s acts. been a member of the board of directors of Theater Wagon of VA since 2003.
is a special event at a special place but the driving force is the tireless efforts of a lot of generous volunteers who give time and money out of love for the community. (1) “It’s small: the theater only seats around 200 and that’s with us bringing some extra chairs. This size enables our audience to really connect with our performers and vice versa. Performers have been known to show up for the Sunday morning sing-a-long, or even join an open-mic performance unannounced. And there’s plenty of time for interaction and CD signings. (2) We get really high quality performers: We strive to bring some well-known and some less-known, but all high quality artists representing the diversity of the genre of folk music. We try to mix up bands, solo acts and duos, bluegrass to blues, singer-songwriter to Americana folk-rock. (3) The festival is well-run: From the little touches like flowers around the stage and in the restrooms, to starting and ending on time, we keep a relaxed, friendly, high-spirited atmosphere. We take suggestions from our community on everything from artists to improvements in management.” The music festival happens in early August each year and the plays are spaced all through the warm summer season. If you like music festivals and if you like plays presented under the open sky then you must attend one of the Oak Grove Theater productions. Oak Grove Theater is located in Augusta County just west of Verona, VA on Quick’s Mill Road, 2.1 miles west of the intersection of Rt. 11 and Rt. 612 in Verona. Those traveling I-81 should take Exit 227 and go west to the Verona intersection of Rt. 612 and Rt. 11. You can fine more information about Oak Grove Theater and links to the music festival on the website: www.oakgrovetheater.org. magazine, while we have a huge family of music players and fans, it seems that there is reoccurring news about the closing of yet another local music store. Of course, the recent economic distress certainly has taken its toll on local businesses; however, that fact is not the whole story. A combination of big box retailers and www.Idonotbuylocal.com internet purchases cuts into the razor thin profit margin of mom and pop music stores. Maybe the business model itself is changing. Recently, at the Red Wing Roots music festival I happened upon a vendor tent that reminded me of a miniature music store. The vendor’s name was the Carolina Old Time Instrument Supply. On display were a selection of entry-level string music instruments and an array of accessories that players always need. Now a vendor at a music festival selling music instruments is not unique but the usual fare is high-end custom instruments often to be made as ordered. This operation seemed to be different so I stopped to ask some questions. used right where purchased regardless of the environment. Further, she believes that she will make sales here to folks that would not make the trip downtown to buy the same items after they get back home from the festival. made in hopes that new music makers will purchase the basic tools they need to get started making music. She stocks her store as a franchise from the warehouse of Jackson’s Music, a big Atlanta, GA retailer, and replenishes her wares as she moves from festival to festival. It is certainly a new business model and even Ms. Burton does not yet know how successful she will be at this. Nevertheless, she is up-beat and enthusiastic and looking forward to the remaining festival season. In January, my husband and I relocated from one of Virginia’s musical meccas, Charlottesville, VA, to Gloucester, VA, a small, rural town on the Middle Peninsula of the Commonwealth. My husband took a new job at an oyster hatchery, so after finding a house to rent, off we went! As we packed up our cars on a cold, rainy day, we mentally prepared ourselves to leave our friends, our folk band, our very musical town, and the mountains behind. We knew we were trading that for rivers and seafood and new adventures, but we didn’t know if we were going to be getting any local music in the deal. When I think of Charlottesville, I think of live music 7-days-a-week. I think of jazz, and of folk, bluegrass, and old time. I think of any number of wonderful small venues. Photo by When I think of Gloucester, Kathy Keeney I think of daffodils and rivers and farms, but not music. So, being a music lover married to a music lover, it became my mission to find live Americana music in and around my new hometown. places of business on Main Street in Gloucester feature live music on occasion, but the only way we found out was to walk into their stores or see their signs from the street. Many of them do not advertise online. it does: “Yes, we have worked very hard to cultivate an atmosphere that families could shop and enjoy some free entertainment.” She also mentioned that they welcome any family-friendly style of music, and attempt to book local acts whenever possible. We very much enjoy the event, as we are able to grab a refreshing beverage after going for our jog, and then hang around to enjoy the music. We can also buy local produce or meat, which is wonderful. 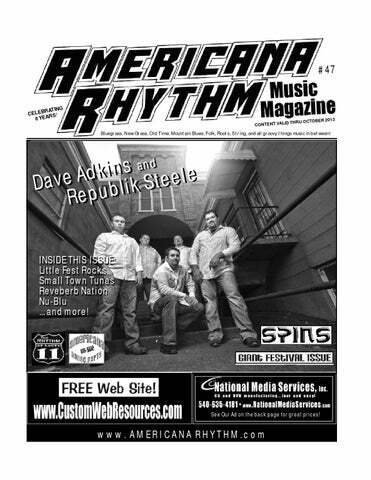 Advertise In Americana Rhythm Music Magazine ~The only regional music resource of it’s kind~ Our 8th year in print! Otto Wood The Bandit Yesterday was July 10th. It wasn’t a day to watch the fireworks, have a picnic, wave a flag, or sing “the Stars Spangled Banner.” Nope. Yesterday was the 83rd anniversary of the day that the famed outlaw Otto Wood made his tenth and final escape from Central Prison in Raleigh, North Carolina. Central Prison was not a place to have a tea party on the lawn. Completed at a cost of $1.25 million in December, 1884, it was the first prison built in North Carolina. They say it took inmates fourteen years to construct the original castle-like structure, which was built with granite quarried just outside the prison’s east wall. To this day, the prison is located west of downtown Raleigh on 29 acres of land. Most of the land is enclosed by a double wire fence with razor ribbon on top. It’s not the place they send you for an overdue library fine. and he struck him fatal blow And this is the way the story goes They spread the news as fast as they could, The sheriff served a warrant on Otto Wood. The jury said murder in the second degree, Then judge passed sentence to the penitentiary. Otto, why didn’t you run Otto’s done dead and gone Otto, why didn’t you run When the sheriff pulled out his .44 gun. They put him in the pen, but it done no good, It couldn’t hold a man called Otto Wood. It wasn’t very long ‘til he slipped outside, Pulled a gun on a guard said “Take me for a ride.” The second time they caught him was away out West, In a holdup gang he got shot through the breast, They brought him back and when he got well, They locked him down in the dungeon cell. He was a man who would not run, He always carried a .44 gun. He loved the women and he hated the law, And he just wouldn’t take noboby’s jaw. Otto, why didn’t you run Otto’s done dead and gone Otto, why didn’t you run When the sheriff pulled out his .44 gun He rambled out West, and he rambled all around, He met two sheriffs in a Southern town. The sheriff said “Otto step to the way, ‘Cause I’ve been expecting you every day.” He pulled out his gun and then he said, “Make a crooked move and you’ll both fall dead. Crank up your car and take me out of town,” But a few minutes later, he was graveyard bound. Otto, why didn’t you run Otto’s done dead and gone Otto, why didn’t you run When the sheriff pulled out his .44 gun. This article is based on a chapter in Wayne’s book, Outlaw Ballads, Legends & Lore. For a Free catalog of Wayne Erbsen’s songbooks and instruction books for banjo, fiddle, guitar and mandolin, get in touch with Native Ground Books & Music, 109 Bell Road, Asheville, NC, 288 05, (800) 75 2-2656, ba njo@nativeg roun d, www.nativeground.com. The Farewell Tour including festivals, folk clubs, and performing arts centers. Billed as Man Of Constant Sorrow Tour: The Dr.’s Farewell, he will be accompanied of course by his fabled Clinch Mountain Boys. Stanley began his career in 1946 with his older brother Carter, touring and recording as the Stanley Brothers. Carter died in 1966, after which Ralph moved to center stage as a solo artist. The tour will coincide with Dr. Stanley’s 67th anniversary as a professional performer. For more information visit www.drralphstanleymusic.com. A guy basically gives up on his dream of playing music – for noble reasons of course – it’s time to settle down and build a family. However, with music roots running deep, he is eventually prompted out of retirement, “to give it another go.” What happens next is the stuff movies are made from. One of Dave’s first musical influences was Bob Segar. Like any young boy, Dave admired his grandfather and spent any free time he had hanging out with him. “My grandfather was a 46 year underground coal miner in Southeastern Kentucky. And as of this writing, Dave is a 2nd round finalist for the IBMA Vocalist Of The Year award, and the band is a 2 n d round finalist for Emerging Artist Of The Year, and have been awarded an official IBMA showcase. For SPBGMA this past February, they were nominated for Male Vocalist Of The Year, and Most Entertaining Band. Not bad for guy who had given up on music. bluegrass music has already veered off in a number of compelling directions, but always had its inventors around to represent that straight, ‘traditional’ path down the middle. Though some of the most prominent bluegrass pioneers ultimately took a more experimental route (Earl Scruggs Revue, anyone? ), they are a link to the musical past, connecting us to that ‘traditional’ standard that many still believe to be unmatched. But right now that ‘s all changing. tively young is growing up and perhaps even starting to feel old. It’s a transitional and significant time, as we see legends moving on, along with the fans that were most directly connected to their sound, the ones who fought for its preservation. We all miss the mystique of BIll Monroe, but that’s life; that’s what happens when things grow old. In some way it sets us free to appreciate these legends for what they are—innovators and artists— instead of holding on to some small part of their past, hoping for them to recreate it for us in person. Just like any other viable art form, bluegrass is growing, changing, evolving, and the legacy of innovation that once seemed a threat is now defining the music for a younger generation. Our guest writer is Chris Pandolfi, banjo player and one of the founding members of The In famous Stringdusters. He was also the keynote speaker at IBMA in 2011. He lives in Denver. they are not the ones defending some ‘traditional’ concept of the music. As has always been the case, professional bluegrass musicians young and old are overwhelmingly open-minded on the topic of musical evolution (it’s that blockbuster fact that the purists always manage to leave out). There are numerous examples including Ralph Stanley’s recent collaboration with Pretty Lights, Jesse McReynolds’ album of Grateful Dead music, the heavy influence of country music on the Osborne Brothers sound, and Wiseman’s upcoming album with Merle Haggard. that standard is still pretty firmly intact to those within the community, despite the vibrant evolution that has been bustling right outside the gates. founders do venture outside bluegrass, they also bring us back, and fans covet the rare opportunity to experience the origins of the music. That’s how young bluegrass is! To many, the legends literally keep the past alive. one that has paid off, because it turns out that lots of people outside our community love bluegrass and all its musical relatives! A similar thing is happening within IBMA, which as of this year is moving to Raleigh and embracing a much broader spectrum of music. It’s true that the evolution of acoustic music is well underway, but it appears that only now are these new styles finding a meaningful way to be tied to one of their most significant ancestors—bluegrass. The examples of bluegrass icons venturing outside the genre are countless, but the reasons are simple: real artists strive to create and evolve, and they need to find an audience that will sustain them. Bluegrass has always struggled with commercialism, an obvious factor in the growth and development of any genre. Fans connected to that beautiful, original version of the music have a shockingly narrow definition of what bluegrass is and don’t want to see it change. The folk music boom of the 60’s-70’s was an obvious place for bluegrass musicians to find new fans, but it further fostered this hyper-opinionated version of fandom that sought purity and shunned commercialism. The opinion factor is exacerbated by the fact that so many die-hard fans are also part-time players, giving them a powerful sense of increased ownership over the music. They strive to preserve the art form, but in a way are doing just the opposite. You can’t fault them for loving the music, but bluegrass exists because it is amazing, not because its followers hoped to keep it a certain way. For at least a period in the early going, before a small genre’s available audience reaches critical mass, artists cater to audience opinions and growth can be stunted. access/preserve the past, mixed with all the amazing things that happen when people learn music together by ear. Anyone exploring the instrument will have easy access to hours of Earl on video, and serious banjo players will always learn from Earl. Lester Flatts and Earl Scruggs that will inspire more banjo sales than Earl ever dreamed of. But for those who find their way back, Bill Monroe and Earl Scruggs (and many more) will get the credit for kicking off this amazing streak of innovation, not just for that one version of bluegrass that they conjured up nearly 70 years ago. Great musicians will always gravitate to the simple, soulful perfection of bluegrass, assimilating the parts that appeal to them, mastering them and incorporating them into an array of musical styles. Good music lasts and informs what comes later, genres bleed together and new worlds are discovered— that’s how music works. We’d love to show up in your mail box six times a year! Thank you to Amy at The Bluegrass Situation for granting us permission to reprint Chris’ article. 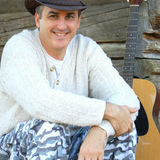 You can check out The Bluegrass Situation at www.TheBluegrassSituation.com. blessings that come from making music. If you are a nonmusician, it’s time to start playing. promoters are looking forward to next year. New bands are coming to the front. Congratulations to the Judy Chops for being voted as the best Local Roots Band at the festival. Missed it? No worries; there are still a dozen or so music festivals to take in before the snow flies. Carolyn and Daniel Routh formed Nu-Blu ten years ago in their home town of Silver City, NC. Daniel and Carolyn both had musical experience playing together in Christian Rock and Classic Rock bands together, but what they really wanted was to get back to their roots and start a bluegrass band. “We both knew that we wanted to make music our full time occupations,” Carolyn recalled, “and began working from day one with that goal in mind.” That was ten years, five CDs, and multiple IBMA nominations ago. Today they are on the road celebrating that success with a new CD, Ten, and a new single, “That Road.” They are doing a series of Sam Ash appearences and work shops as well in conjunction with The Ten Tour, sponsered by Peterson, QSC, D’Addario, and Sennheiser/Neumann. showing the world how it’s done. Midway through their second year at gorgeous new digs within Fort Valley Nursery, the Market opens with a smile every Saturday. Cheerful merchants and plentiful fresh produce and handicrafts are displayed with pride, rain or shine. The Nursery has provided the Market with sunshine-filled space under one of their grand pavilions. Fantastic foods with a Smile every Saturday isn’t a new concept. You may ask yourself; what makes THIS Market so special. welcome to our latest edition of SPINS! How can these guys keep making such great music? Wow! Grab your iPad or Smart Phone and dial up some of these fine folks. We bet you love them all - we do! ATTENTION Keen individuals involved in indie music making are looking for an equally keen and reasonably priced folk/bluegrass producer with proven track record for their new project. St ill on ly $16 Fo r 6 iss ues!